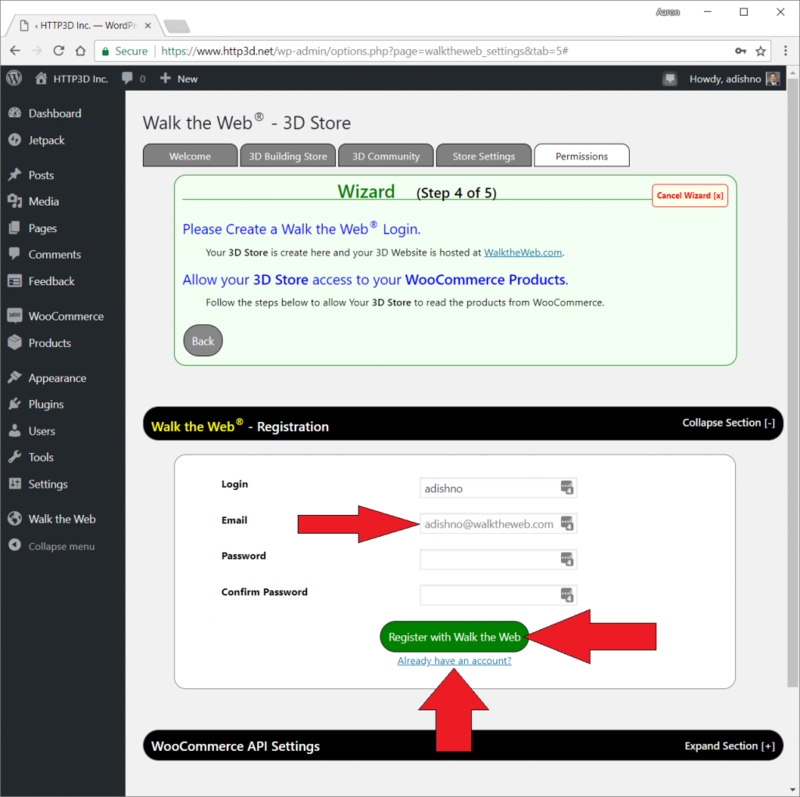 This article takes you through the Walk the Web® – 3D Store plugin for WordPress with a WooCommerce Shopping Cart. 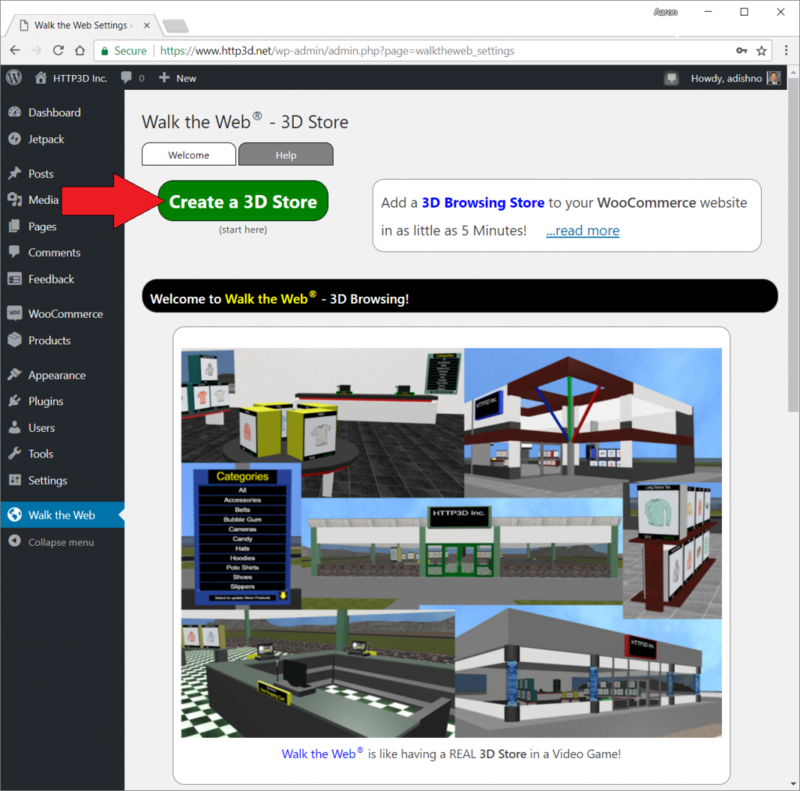 You can also read more about 3D Stores. 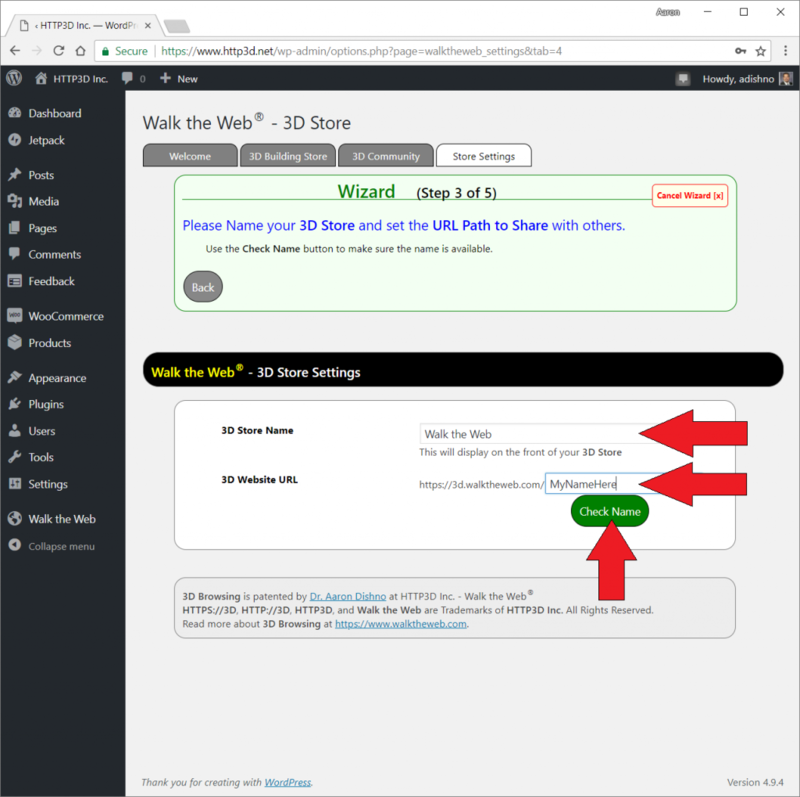 To start, download and activate the Walk the Web® – 3D Store plugin. Navigate to Walk the Web on your WordPress menu. Click Create a 3D Store to begin. 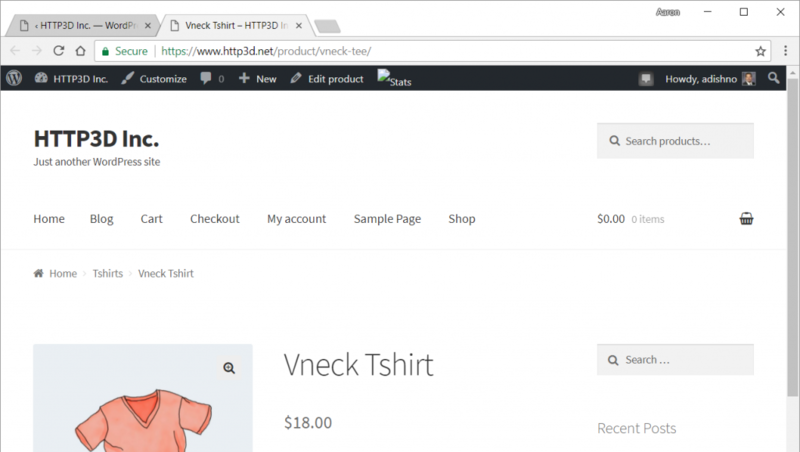 Review the various 3D Store templates and select one with the button or clicking on an image. 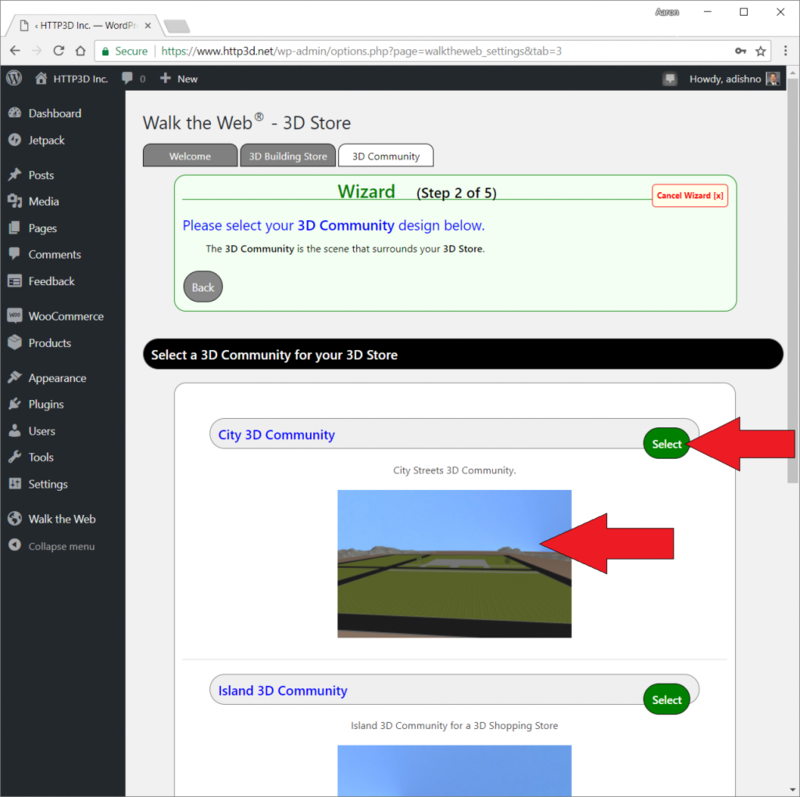 Review the various 3D Community templates and select one with the button or clicking on an image. The 3D Community provides the landscape and surrounding 3D Things to create the 3D Scene. 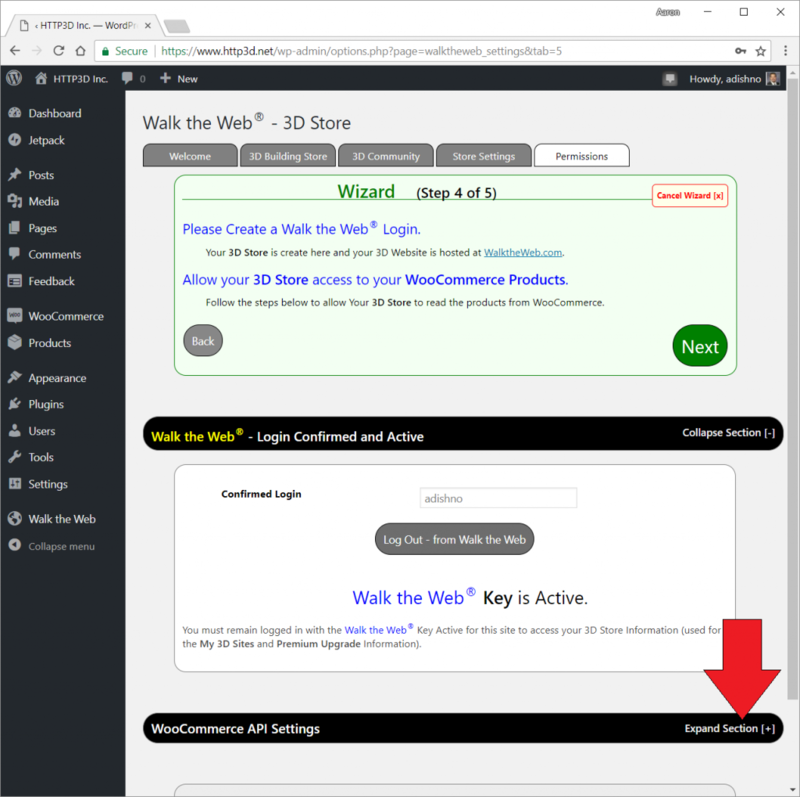 If you are already using a 3D Website URL it will let you know with a warning. 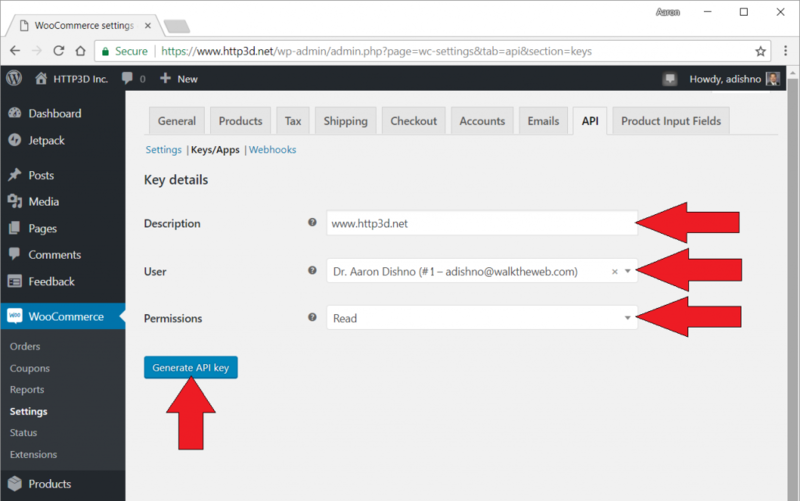 You can continue with that name and the system will automatically rename the other site based on your user login name. 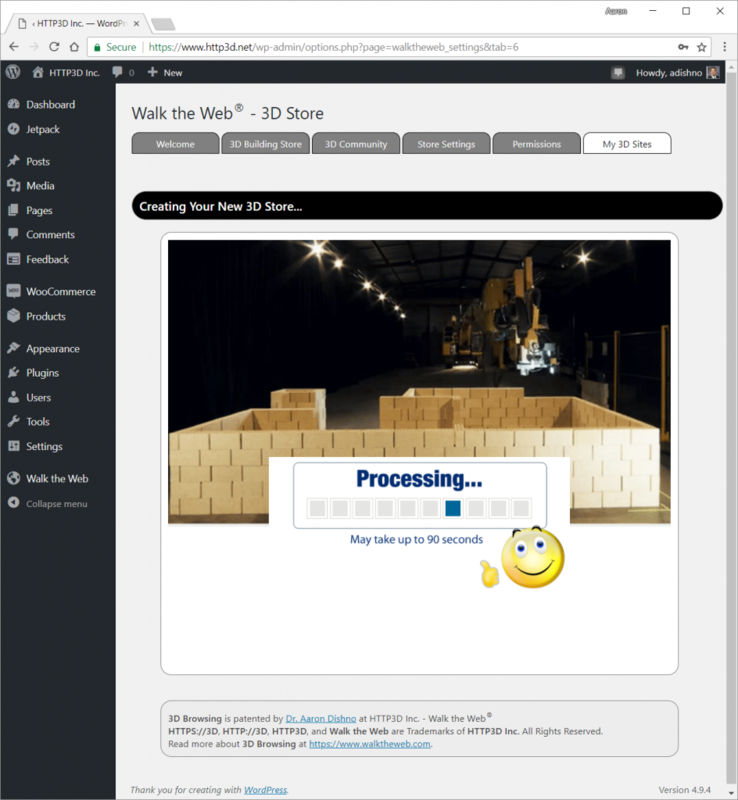 You can view the new name and change it if you desire following the Create 3D Store steps. Otherwise, you can choose another name and change it manually after the new site is done. 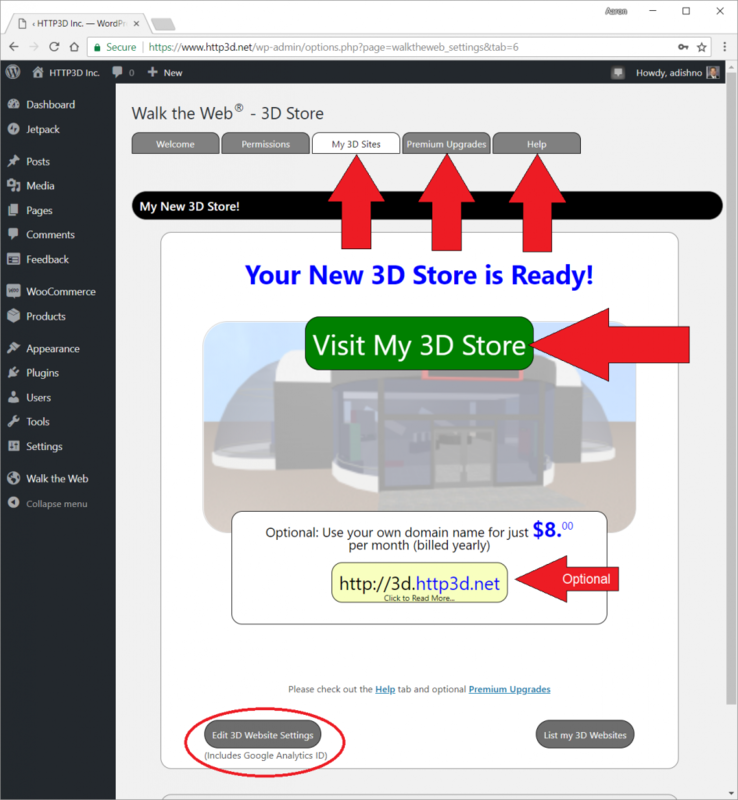 When you have entered a 3D Store Name and an available 3D Website URL, the Continue button will appear. 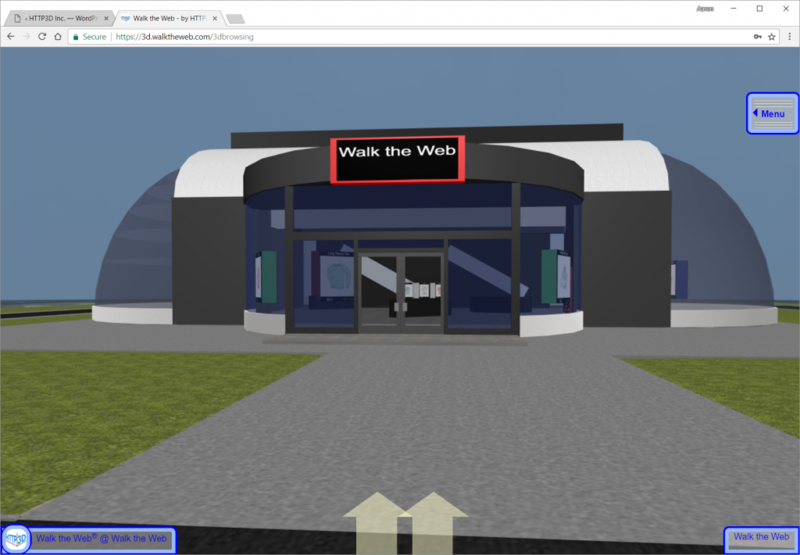 The Walk the Web® plugin is installed on your traditional website to assist with 3D Website creation and settings, but your 3D Store website will be hosted on Walk the Web® servers for free. Think of it like having a Twitter account. 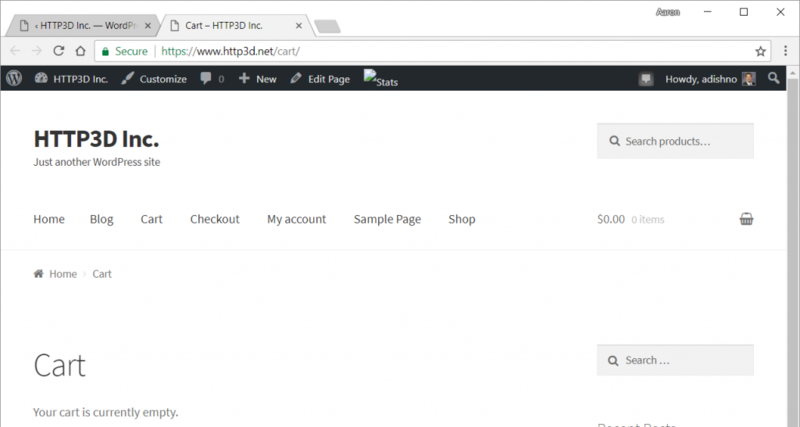 The Email address will be automatically read in from the WordPress website. 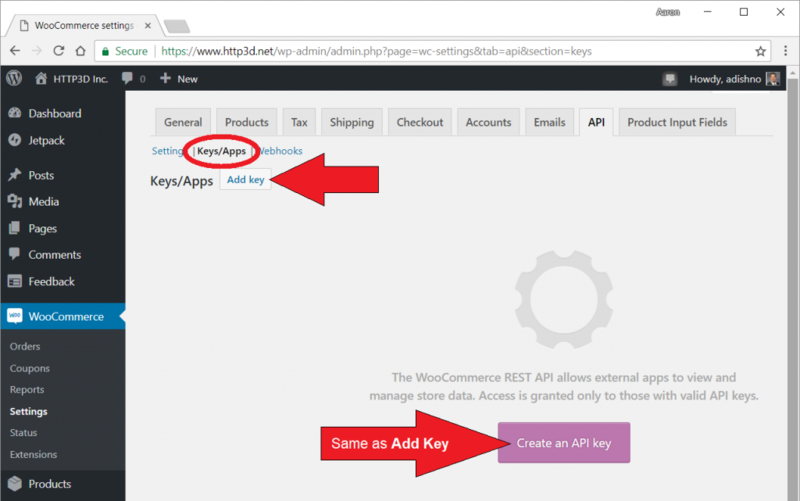 After you register or login it should automatically open the WooCommerce API Settings. If not, just click the Expand Section link on the right of that section. Description can be anything you like. We recommend the name or URL of your site. User defaults to your user. Any user with Admin privileges will work. Permissions should be set to Read. The 3D Store only reads the product and category information. 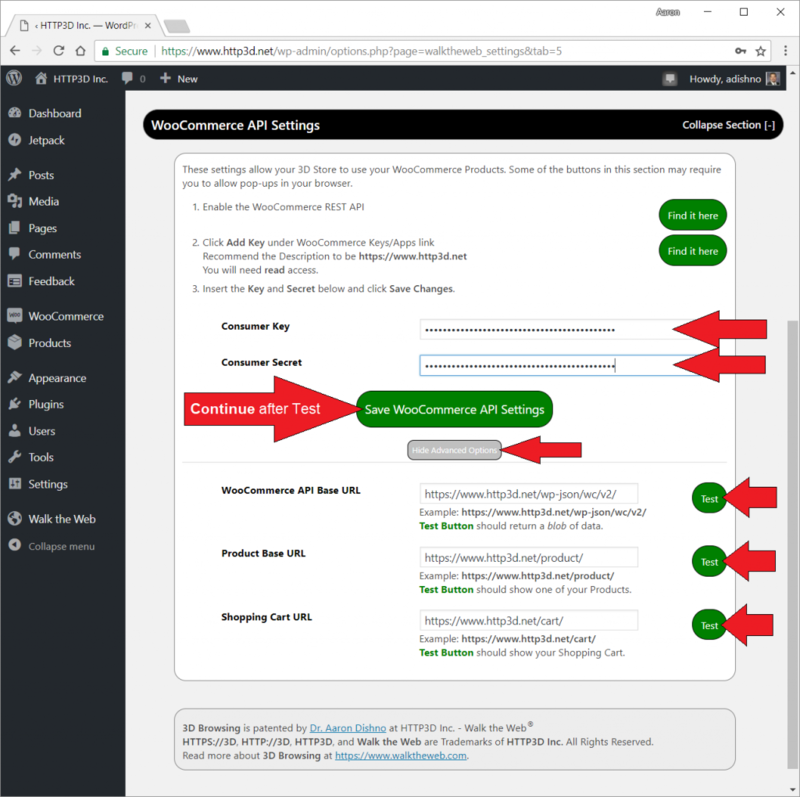 It does not change any values in WooCommerce. 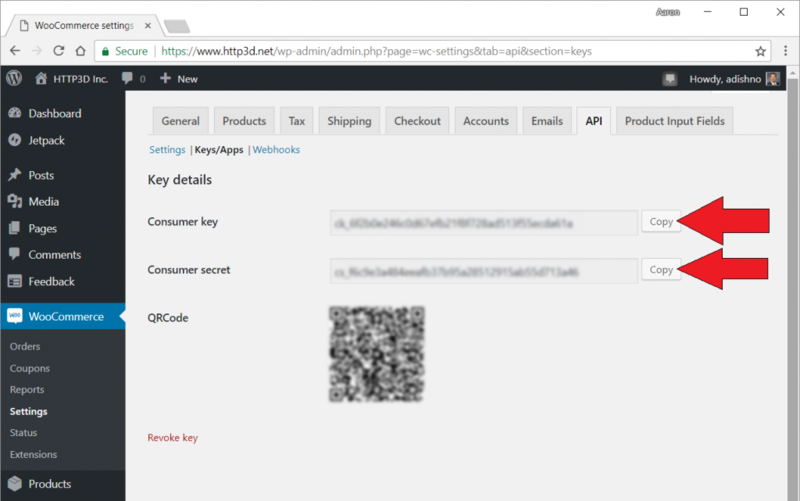 Click the Copy buttons and Paste the values to the Consumer Key and Consumer Secret fields back on the Walk the Web® form. Paste the Consumer Key and Consumer Secret then click the Show Advanced Options button to show the test buttons. 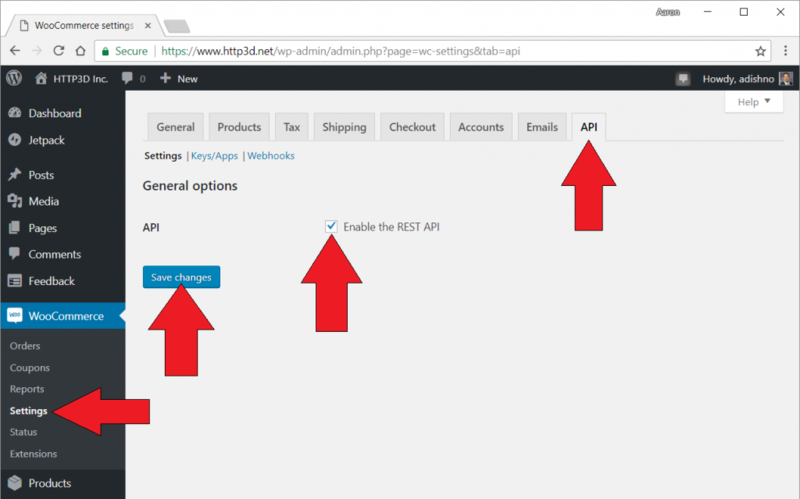 Click Save WooCommerce API Settings then the Next button on the Wizard panel to continue. Review your settings. You can click edit next to any of them to revisit the setting. 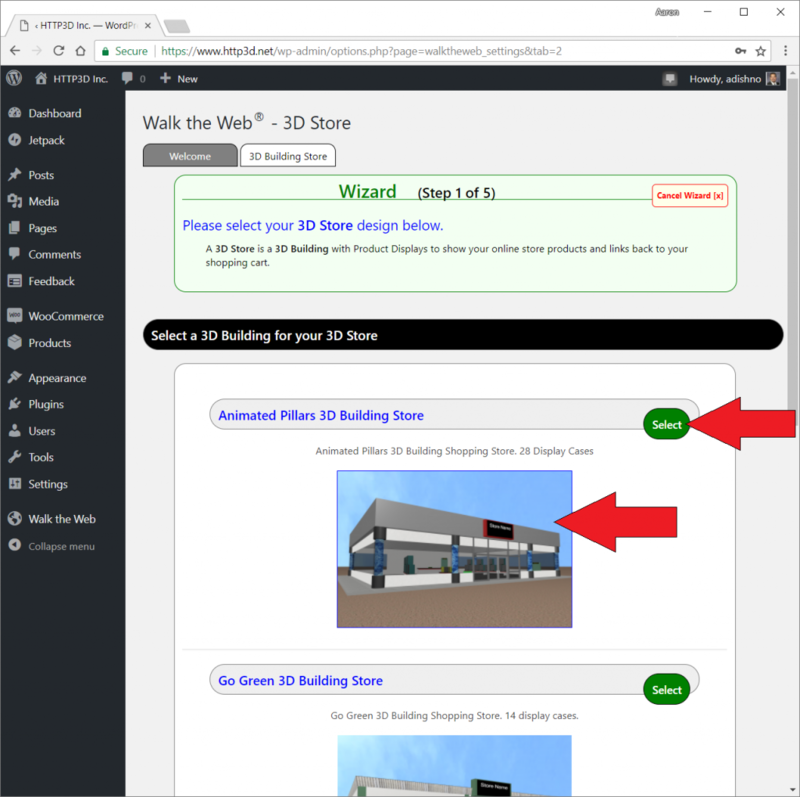 My 3D Sites tab – will show a list of your created 3D Stores with links to edit the settings. 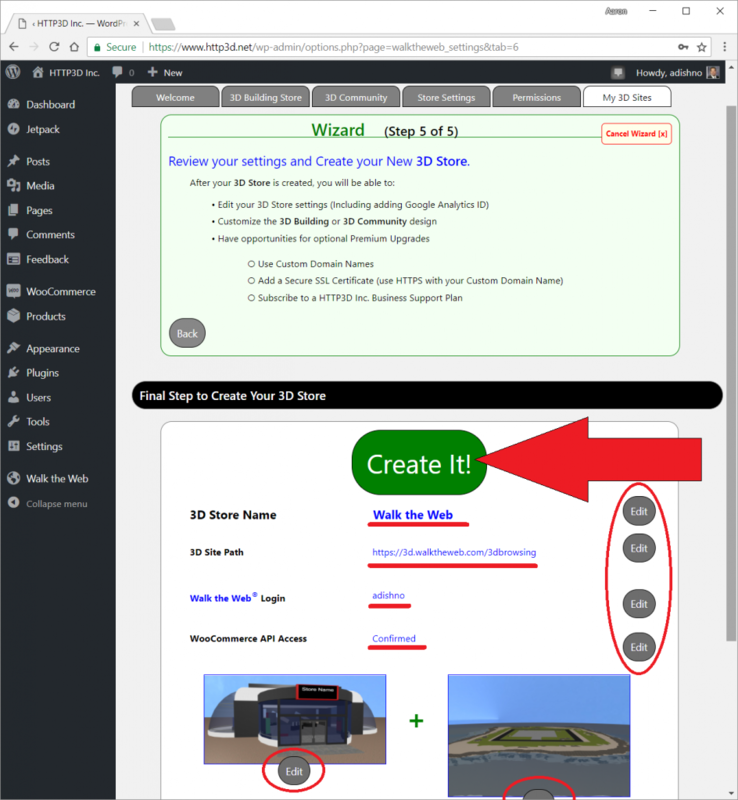 The List My 3D Websites button shows the same as the My 3D Sites tab. Premium Upgrades tab will take you to optional personalization and Service Plan options. The Optional Offer can also be found on this tab.